One of the wonderful things you can do with your embroidery machine besides create beautiful embroideries on clothing and quilt labels is quilting your quilts in your embroidery hoop! Georgia will show you how to place your designs correctly and hoop your project to achieve a professional looking outcome! Class fee: $50.00 or 2 CC for this all day class. 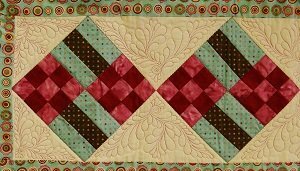 Click here for the Quilting in the Hoop supply sheet.